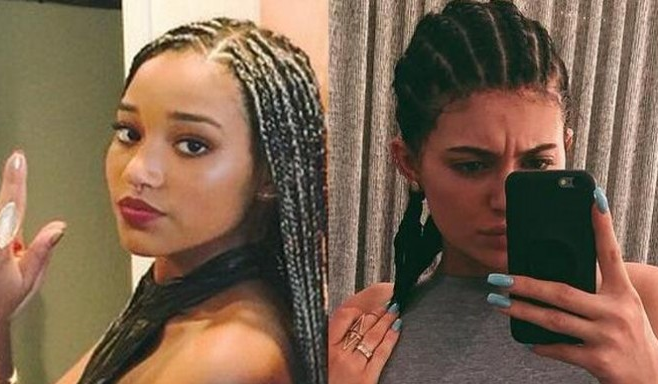 Kylie Jenner got into a brief Instagram war with Amandla Stenberg on Saturday, July 11. The feud broke shortly after the "Keeping Up with the Kardashians" star shared on Instagram a snap of her with her hair in cornrows alongside a caption that read, "I woke up like disss." After learning of Kylie's new photo, the star of "The Hunger Games" slammed Kylie on the comment section. "When u appropriate black features and culture but fail to use ur position of power to help black Americans by directing attention towards ur wigs instead of police brutality or racism #whitegirlsdoitbetter," Amandla was quoted as saying. Kylie replied the comment, writing, "@amandlastenberg Mad if I don't, Mad if I do.... Go hang w Jaden or something." She referred to her mutual friend and once rumored boyfriend Jaden Smith whom Amandla took to prom back in May. So far, neither of the girls has continued the feud. Kylie's new cornrows hairdo came just days after she colored her hair icy blue and debuted it at Bellami Beauty Bar. In an interview at the event, Kylie said she dyed her hair because "I just wanted to do something different and fun, and I haven't switched it up in [a while] so... I'm just having fun." When being asked if the coloring process took a long time, Kylie replied, "It took a while, so it's kind of crazy, but it's fun."